Shawna Robinson, in remission from breast cancer, was a wealth of information for her son when Tanner Clark underwent chemotherapy for testicular cancer. 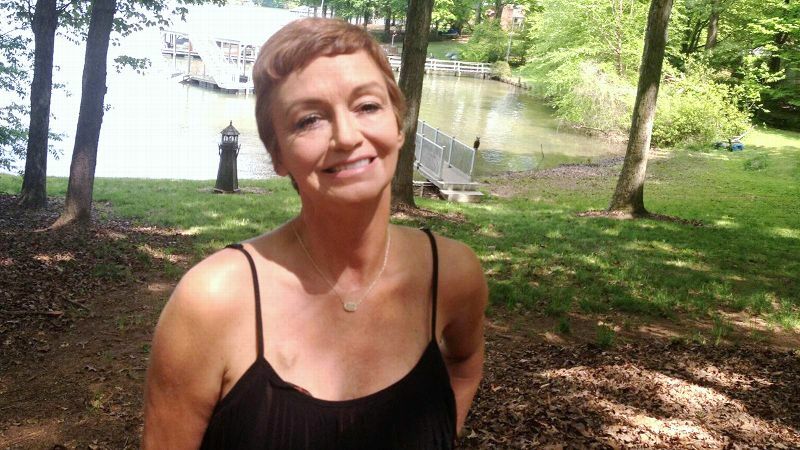 CHARLOTTE, N.C. -- When former race car driver Shawna Robinson completed her final radiation treatment for Stage 3 breast cancer in September 2015, she thought the dreaded disease was in her rearview mirror. After all, she was in remission. A little more than six months later, cancer again would affect her family. Her son, Tanner Clark, was diagnosed with testicular cancer just two days before his 20th birthday. "I was a mess [when Tanner was diagnosed]," the 51-year-old Robinson said. "I didn't know what to think. But then you have to pull yourself together because you have to be strong for him and let him know we'll get through it." Tanner's diagnosis was the continuation of a nightmare family saga that began in January 2014 when his 69-year-old grandfather, Dale Clark, lost his battle with prostate cancer. Two months later, Tanner's mother was diagnosed with breast cancer. Robinson faced an arduous 1½-year battle that involved surgery, chemotherapy and radiation treatments. Sue Clark, Tanner's grandmother, lost her brother to lung cancer in the fall of 2015. And then in April 2016, Tanner was diagnosed. 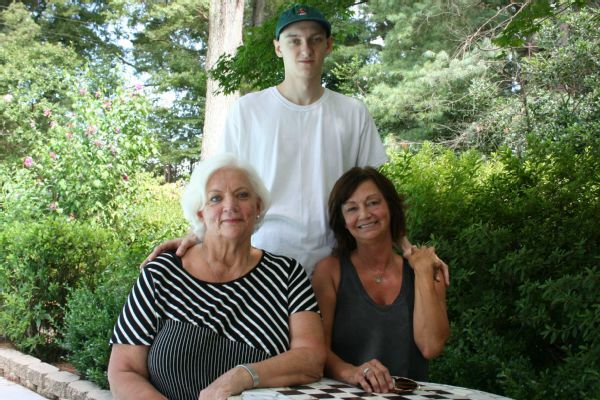 When Shawna Robinson was going through treatment for breast cancer in 2014-15, her son Tanner Clark opted to attend community college for a year to be near his mom. Although Sue's son, Jeff Clark, and Shawna Robinson divorced in 2000, Sue Clark opened her Charlotte home to Shawna and children Tanner and Samantha (now 19) when Robinson was undergoing treatment for breast cancer. The children frequently stayed with their grandparents when Shawna and Jeff traveled for their racing careers, and already had rooms there. "Even though she and Jeff are divorced, she has always been a big part of our family," Sue said last year as Shawna neared the end of her treatments. "It just made it easier for everybody involved." Shawna, Tanner and Tanner's girlfriend, Mandy Cressman, were back in Sue Clark's home recently, reflecting on their cancer battles. When Tanner discovered a lump while visiting Cressman in Arlington, Virginia, he sent a text to his grandmother and asked her to make a doctor's appointment for him -- a lesson he learned from his grandfather's experience. An ultrasound revealed a malignant tumor. "[Dr. Glenn Holladay] said there were two lumps instead of one," Tanner recalled. "He said when there were multiple tumors, there was no way it's benign." Surgery was scheduled immediately, but chemotherapy didn't begin until two months later. Tanner, an online gamer, had a tournament to attend and didn't want to let his three teammates down. The doctor didn't recommend the two-month wait, but said he believed all of the cancer had been removed because no tumor markers existed after the surgery. "They wanted to do chemo just to make sure there wasn't that small, minute chance there might be a microscopic cancer bug somewhere that could spread," Sue Clark said. "That had a lot to do with the decision on one or two rounds of chemo. One round is brutal because it's every day for five days. I was devastated over them doing all of this to him in one week, but that is how they treat testicular cancer." Tanner's chemotherapy lasted three weeks overall. In the first week, he received chemo six hours a day for five consecutive days. The second and third weeks, he received chemo each Monday, and fluids on Wednesday and Friday. After his first chemo treatment, Tanner said he realized he couldn't continue his pursuit of "Call of Duty" in his normal fashion. He composed a tweet for TwitLonger while receiving his second dose of chemo, explaining why he wouldn't be involved in online gaming for numerous hours. He encouraged everyone to become aware of their bodies and their health. He noted his stream would be temporarily inactive, not dead. "I've been dealing with this, I'm still going to be grinding. I do not expect sympathy or anything further to come from this, my intent is to inform," Tanner wrote in his tweet. The courage with which Tanner faced cancer impressed his father. "That really gave me a sense of his maturity and his ownership of what he had. I'm very proud of him. He always looked at it as temporary. His attitude helped us through the ordeal." Tanner's parents went to his first chemotherapy treatment together, remaining with him the entire six hours. Throughout Tanner's treatments, Robinson often would take him there, and his father would bring him home. "I give Shawna a lot of credit," Jeff Clark said. "Shawna could give true testimony to Tanner on what he was going to experience, what he was going to feel. He took that to heart. That gave Tanner a real sense of respect and appreciation for his mom. She helped him get through a lot of the unknown." 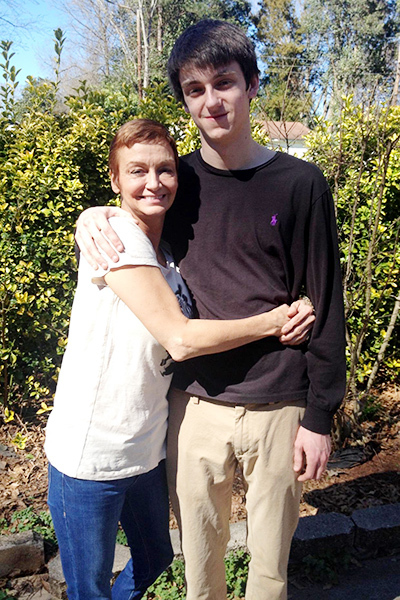 Robinson noted that the chemo quickly took a toll on her 6-foot-2 son's lean body. He weighed 150 pounds when he began the treatments. After the first week, his weight had dropped to 138. Sue Clark (left), Tanner's grandmother, has been there for both Shawna Robinson and Tanner even though Sue's son and Shawna were divorced in 2000. Tanner said having his mother accompany him to treatments was instrumental. "The best part was having her at the hospital with me because she's been in the bed I was in," Tanner said. "They don't explain to you how chemo feels and how it goes." Robinson said she and her son experienced many of the same side effects of the chemo. A notable difference was when the hair loss began. Robinson said her hair came out in clumps, while her son's shed over several days. Tanner often wears a ball cap to cover his bald head. He said he still experiences dizziness and confusion. "His body is still carrying it [chemo]," said Robinson, one of just 16 women to compete at NASCAR's highest level and one of three, along with Janet Guthrie and Danica Patrick, to race in the Daytona 500. "I don't know when I'm going to feel the same again. I still feel weakness. He had a lot of the same reactions I did." Doctors will monitor Tanner for 18 months. Every two months, he will have blood work to check for tumor markers, and every four months he will receive a scan. Tanner and the rest of the family have altered their diet significantly because of cancer. They have switched to almond milk and have drastically reduced their sugar intake. Sugar-coated cereals are gone from Sue Clark's kitchen. Tanner's daily breakfast now consists of plain Cheerios with fresh fruit. All candy in the house is sugar free. Tanner also is attempting to reduce his red meat intake. "Our racer mentality makes us feel we have the ability to fix anything," Jeff Clark said. "When you're faced with these real-life health issues, it resets your mind to understand how fragile we are and how fragile life is, and to make the most of family time as much as we do our racing time. "We're all guilty of sometimes putting too much emphasis on racing. Things like this really bring us full circle to realize the value and importance of family." Deb Williams is a North Carolina-based writer and former editor. She has covered auto racing for United Press International, USA Today and The Charlotte Observer.